Polyspun weed block fabric is a reliable geotextile which is effective in discouraging weeds from taking root in the landscape. This material allows for water, air and nutrients to flow through while providing a tough barrier against weed roots. Designed for applications which require a heavy-duty weed barrier, this fabric is thick, durable and can also be used to provide stabilization to the soil below. This fabric is marked with planting strips for easy spacing when planting in rows. This ultra-heavy duty fabric is ideal for placing below rubber liner in pond applications to protect against sharp objects which threaten to puncture the liner. 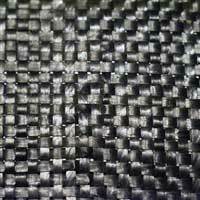 This non-woven fabric can also be placed below rip rap in construction road applications to act as a soil barrier. For driveway, road construction or paver subgrade stabilization. Driveway fabric is a woven 200 lb strength fabric which is designed to stabilize and and provide soil separation for areas which will be subjected to heavy traffic or hardscapes. 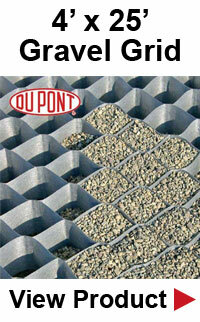 Drainfield fabric is perfect for providing a filter between the ground and the exit pipes in a drainfield application. These fabrics feature a high permeability rate allowing water to easily flow through while keeping the dirt and debris out. Designed for demanding drainage applications, these drainage fabrics are heavier in weight than the drinfield fabric while offering a high water flow weight. Acting as a dual function fabric, drainage fabric can also be used to contain erosion in the drainage area. This woven ground cover fabric is ideal for greenhouse or outdoor planing applications where a uv-resistant fabric is required. Planting strips allow for convenient row alignment and the fabric also helps to prevent weed growth. We offer the complete line of Dewitt landscape fabrics which cover nearly every landscape application. 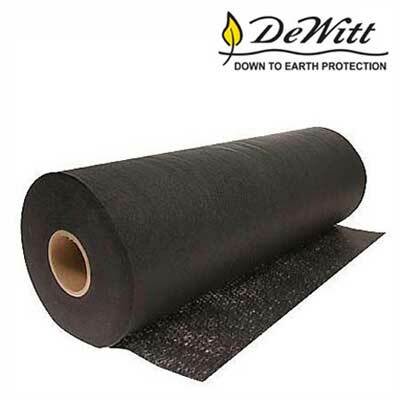 With a wide variety of roll sizes and weights, there is a Dewitt solution for nearly every application.